Price:$35 half hour/$60 full hour - $5 extra for home visits. 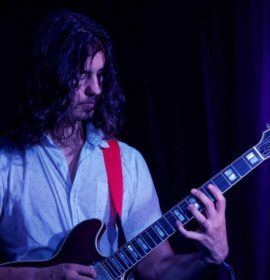 Jake teaches in Bondi and the eastern suburbs and is happy to teach all levels and ages. He has a Bachelor of Music at the Australian Institute of Music He has 6 years teaching experience and a few years of gigging under my belt. Jake has various learning pathways for new students. Straight to playing, which lets students get to playing chords, riffs, solo’s etc… as fast as possible. If you want we can go a bit deeper and look at the theory behind what we are playing to gain a deeper understanding of music and theory. And last but not least songwriting, which involves analysing various songs and composers and utilising music theory to see how they created their songs. Jake teaches in Bondi and the eastern suburbs and is happy to go to students location and is flexible with his schedule. 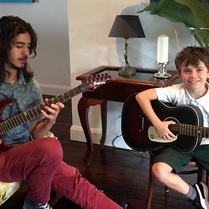 Jake can play and teach electric, steel string and classical guitars as well playing a range of styles from; Blues, Funk, Jazz, Rock, Metal, Gypsy Jazz, Classical and Singer/Songwriter. The lessons with Jake are going really well, he’s a patient teacher. “I had my second lesson with Jake yesterday – he’s a superb teacher – very patient, encouraging and helpful.